Yes, I'm sitting in a dining room chair at our dining room table watching the birds & butterflies in our backyard. There are three new cats that walk through our yard. They must be watched. Very carefully. One looks like Spirit. Meowmuh doesn't let us out of our house unless we're in our carriers, our stroller or on a leash/harness. Hey you Black Cats. Let's celebrate! Friday Oct. 27 is National Black Cats Day. DID YOU KNOW: 22 breeds can come with solid black coats. The Bombay breed is exclusively black. Black coats are more prevalent in males. Genetic mutations make us more resilient to disease. Excessive melanin causes our coats to be black. We're easy to name. Adopt one of us. This cat "hangs out" on our wall. He's cute but he looks like a brat...like "a force to be reckoned with." Meowmuh loves the artist that drew him, Jamie S. Perry. She is a colored pencil artist who creates drawings, prints, pet portraits, tote bags and t-shirts. Find her at www.jsperry.com/products/prints. Black Cats have been the subject of sculptors, painters, photographers, and authors since time immemorial. Cultures variously view the Black Cat as bringing bad luck versus bringing good luck to their household or ship. Ancient Egypt paid homage to the goddess, Bastet (depicted as a woman with the head of a Black Cat). To gain favor from the goddess, Egyptian households kept Black Cats as pets. 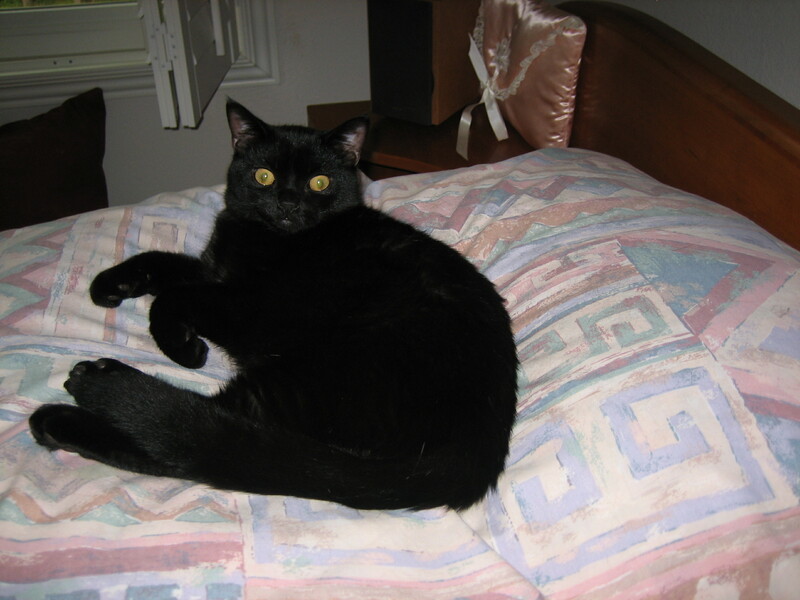 Read the Mews N News article, 'Black Cats,' posted on 12/22/15 which depicts superstitions, factoids & iconic Black Cats.